Creekside is the perfect property for those that want some room to spread out. As you appraoch through the gate and take your first corner on the driveway you'll see the house setting near the edge of a bluff. The home is neat, modern and well stocked for your stay. Go in, unload and get ready to play. The property has several smaller trails that are perfect for supervised children to explore. Search for the spring that appears out the side of a hill and disappears again into the ground. See if the kids can find the conjoined tree. A tree connected by a big root where one side is dead and the other flourshing. Find the fern gardens and take note how much cooler it is with the springs feeding the ferns water. One thing you'll notice is the bridge across the creek, which incidentally never runs dry. Cross the creek and you're on a dirt road that loops or takes you to the lake which is approx. 7/10th's of a mile away. Of course you'll want to continue exploring the property before venturing away. Walk up the steep hill or go back a ways and take the easy hill.....you'll come up near the deck that overlooks what people have named "Fern Gulley". The walk back to the house area lights up at night so sitting on either of the two large decks is a matter of choice. There are almost two climate zones on this property. firstly you have the lower wet lands and then the drier upper woodlands where you'll actually find species of cacti. We have also been told by a number of birders that the viewing is quite impressive. Creekside has room to store and turn a trailer on the "sound" coleche driveway. As always, we are a call or email away and are more than happy to answer any questions you may have. This 4 bedroom homes has all the amenities and comfort of a fine home. As is the case with all our houses there is no carpet to trap allergens. All our floors are tile and laminate (wood) flooring. Step outside, the beautiful rear decks 14x24' and 12x12' offer two outside tables and plenty of chairs for that gathering of friends and family (local catering is available upon request to feed your crew). The back yard is fenced in and large enough to enjoy most outdoor activities. Walk down the side of the property to the stairs and you have your own dock....of course, it is a hill and requires a bit of effort to walk up and down. But, when you get there, you have a dock on the beautiful spring fed lake. 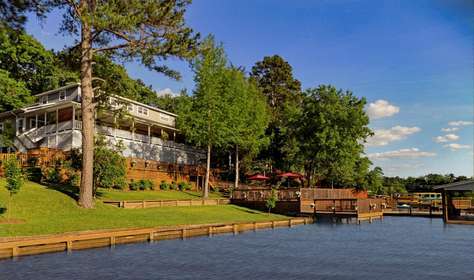 Whether you fish, swim, read or enjoy one of our beautiful East Texas Sunsets, you'll love the comforts and beauty of Henry's Hideaway. Lakeside is our largest and most spacious home. It sets on two lake lots, has a Gazebo and it's very own boat house. If you need more room Henry's is directly across the street and Pat's Place is right next door. Awesome View and the Gregory are both within easy walking distance. The water side of the home has a massive wrap around porch that seems to invite you to sit and enjoy the lake sunsets and wildlife. Ceiling fans and abundant sitting areas make it the perfect spot to eat or play games. The landscape is very attractive with a stone walkway leading to the lake and a stunning display of spring Azaleas and various flowering plants. A switch turns on the pump that recirculates lake water from the top of the stone walk. The water cascades down the river, under two small bridges back to the lake. This area abutts a quiet section of the wrap around porch making it the perfect place to enjoy the sound of the water while reading or enjoying coffee and family conversation. The home faces west and the sunsets are phenomenal. The trees provide shade and the many fans cool the outside temperatures. Of course, a dip in the lake will help keep you cool off even more. The 7 bedrooms and large upper game-room accommodate groups up to (but not exceeding) 22. The large kitchen offers plentiful seating for your group. Local catering is available upon request for those days you don't feel like cooking. In addition, the upstairs game-room has a mini fridge, sink and micro wave. It even has a separate entrance front and back of the home. Lakeside has a gas grill connected to a large tank so running out of propane is not an issue. Please look at our 3d floor plans for layout of the home. It does have a washer/dryer, two refrigerators, televisions in every bedroom with cable. The home has wireless internet, with Netflix in the L.R. and Game room. The Kitchen offers a Kuerig (bring kcups) regular coffee maker (we offer coffee and filters) and a good assortment of utensils in the kitchen. 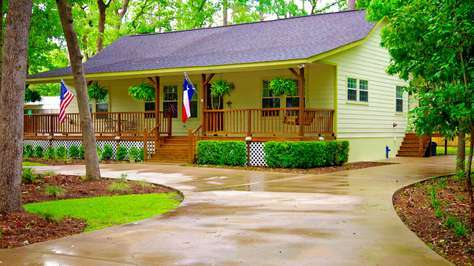 The outside decks, docks and covered porches are too numerous to list. Simply put, you'll have plenty of room. The covered boathouse offers a slip with plenty of tie offs for multiple boats, there are GFCI protected outlets for charging batteries or playing music at a moderate level.. A covered sitting area with lights, fans as well as a large attached dock is the perfect place for that cool lake swim or catching some rays. Utilize the provided kayaks and assorted boats and explore this hidden gem of a lake. We are located in a cove far enough away from the main lake where wave action and boat noise is almost non existent. for additional information about our beautiful lake. ​Our staff is always happy to help!! Pats place has two Master Bedrooms, each with their own entrance to private areas attached to the main deck. The Main deck has a large cover, a large gas grill, table, fans and lighting. The main deck is high up in the tree canopy. It sets 50 or more feet above the lake, the lake is less than 100 feet away. As you might imagine, this makes for incredible views as well as near constant breezes. When people look over the edge of the main deck rail, it is not uncommon to see ones jaw drop in amazement. It is truly a sight to behold, simply massive amounts of decking and dock. 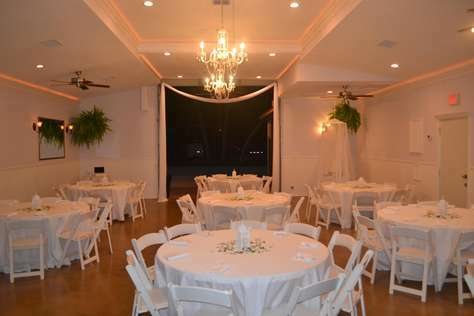 It is the perfect place for a small wedding or corporate event. The cantilevered deck that hangs over the side of the "cliff" always draws a lot of attention. So many places to hide away and enjoy a good book or a little "me" time. As you head towards the normally cool spring fed waters of Houston county lake you'll walk past the fire-pit and it's stone patio. Continue on and you'll see a large dock area, perfect for enjoying some sunbathing, or perhaps a game of cards, there are two boat slips, a fish cleaning station and night lights for fishing. Of course the covered area is a great place to sit while the kids kayak or enjoy a swim. The outside is so awe inspiring, it is easy to forget the inside of Pats Place, it is certainly worthy of description. As you walk in the front door there is a room with a card table and a sitting area for those times you want some "alone time". Tied into that area are the washer and dryer, they can be closed off from the main home. The home is very open and large in it's feel. The kitchen has granite counter tops with an island that is extended to add more dining or socializing room in addition to the bar top behind the sink peninsula. The built in refrigerator is complemented with a smaller island fridge for the kids drinks or adult beverages. Local catering is available upon request for those who want to take the night off from cooking. The living area has two pullout couches as well as two chairs. The kitchen bar is situated so larger groups can all converse with people in the L.R. As you go down the stairs to the game-room there are two pullout couches a Wii as well as game chairs for the kids. 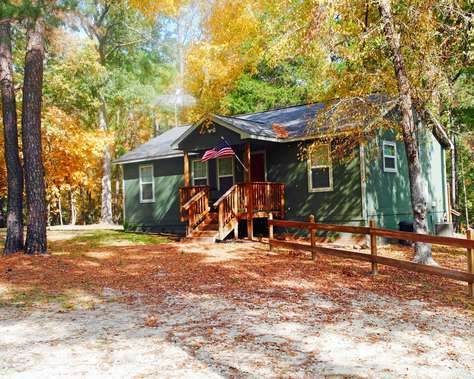 There is a full bathroom connected as well as a beautiful outdoor deck with a picnic table. What may be one of the nicest features of Pate Place interior are the two Master Bedrooms, each with separate bathroom. As mentioned each bedroom has a 6' door to it's own deck area, as well as table and chairs. All of the bedrooms have 32" flat screen televisions, ceiling fans and linens. Bedroom 5 is a double lower bunk with a twin top and 32" television. The game-room can easily be it's own semi private bedroom. It has its own bathroom as well as two queen pullout couches. An additional sleeping area is the Living Room. It has two pullout couches. All of our homes have no carpeting. With cleanliness and allergy issues we prefer to tile and install wood style laminate throughout the home. To access the dock, go up the road and take a slight left when you reach the top of the hill. There you will find stairs leading down to the water, go down those stairs and you will have your own section of a dock! The Gregory is used solely for vacation rental purposes. The home is always clean and ready for our guests arrival. The yard is landscaped and offers a rear covered cabana as well as a fire pit. The lanscape is well cared for and always ready for your arrival. The Gregory has 6 kayaks for your personal use. Take the kayaks out (please wear PFD's) and enjoy the hidden treasures the inlets offer, beavers, blue heron, egrets and a multitude of birds and wildlife. This area of the lake is quiet and far enough away from the power boats that often drown out the tranqui setting that makes Houston County Lake such a treasure. Exploring the cove in the kayaks is a favorite with our guests. After a busy day wearing the kids out swimming and playing at the lake or basketball court it's time to head home. 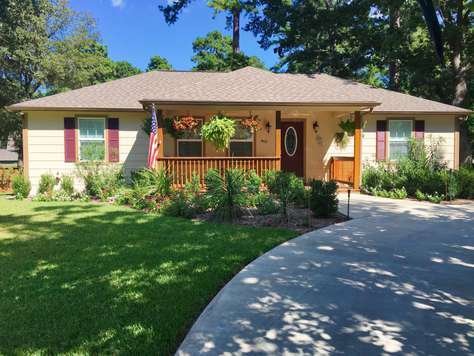 The Gregory is a very attractive home with a great "flow". It has lerger room and plenty of space for you and your guests. Step out back and make smores with the kids, Cook something up on the charcoal grill. Eat inside or out. The Gregory had upgraded inside and outside lighting. A variety of moods can be set by dimming or alternating lighting options. The home has a washer/dryer and modern appliances. The kitchen is well stocked and should provide enough utensils for most any meal you can cook. The Master tub with Jacuzzi is a great place to chill when the kids go to bed. The living room T.V. has netfli and all T.V's have cable, and yes, all bedrooms have televisions. In memory of Greg "The Big Kahuna" Philipon. Do not exceed the house maximum of 7 people (including children). Call first or email if you have questions. Please Note: Contact us prior to booking for any event. The "Event Building" is a heated and cooled building with ceiling fans, loads of lighting options, crown mold and bead board. It is a little more than your typical barn, yet it maintains a sort of "elegant country theme", not stuffy but certainly not rustic. The large opening doors can be open for an open air venue, or closed for inclement weather. A/C can be used with doors open to cool the area (in most weather). The unit has outside (heated and cooled) his and her bathrooms, a large outside sink, exterior fans and loads of exterior lighting options. It has a nice large firepit that comes with complimentary wood (one stack). There is a smoker and gas grill upon request. There are two large covers over the concrete exterior patios. Under the side cover are tables and chairs for outdoor seating. The front cover can be used for seating or dancing in the case of a wedding. Take a trip and view our properties, you'll be glad you did.